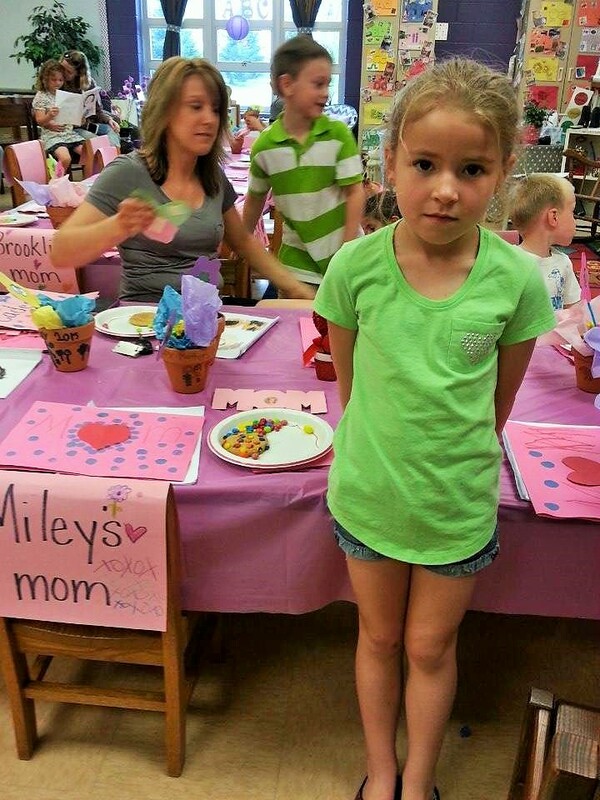 Mothers Day Tea, with Miley at Kindergarten and Prom across the Street – …………. ''AND LET THE FUN BEGIN''……………..
A week ago today, I was invited to attend Mileys Mothers Day Tea at her School. She attends Kindergarten in the Primary Building. Tina and Ed, (parents) were busy and couldn't attend. I arrived at the school around 1:15. 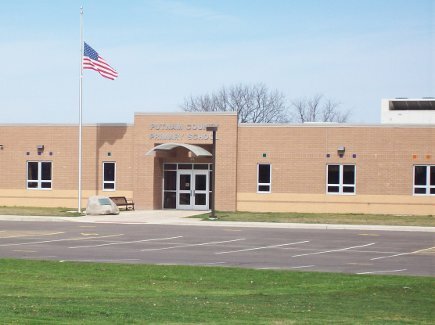 The new school was built several years back, due to a tornado that damaged the old one. The new school was built on the same grounds but placed behind the old one. Across the side street is the High School, where Prom will be on Sat nite. Their was much activity going on in the parking lot. I will tell you about this later. This will only be the 2nd time I have been in this school. I entered the first set of 2 double doors after I heard a buzz and had to go to the single door to the left. In this first room on the side was a teacher monitoring the camera. He had to buzz the door for you to enter. The girl at the desk was Angie, an old school friend of Tina’s. Its strange to see these kids now doing jobs of adults. One still thinks of them as kids. lol. Angie had me sign in, Name, Time, Teacher also a place to sign out when leaving. I was escorted down the hall as I didn’t know where to go. The halls were so bright and full of color. Each class room area in the hall was decorated with art work of the students. I was directed to the room with the Purple Umbrella by it. So cute. Each classroom door had a different color umbrella. Makes it so easy for the kids to find their rooms. All the moms were standing outside the door waiting for the teacher to invite us in. I was the only Grandmother. At 1:30 sharp we were all invited in. Miley took me to her table and showed me the things she made for mom. An awesome book. 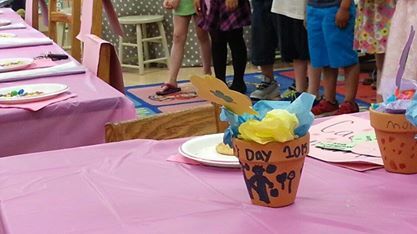 A decorated Flower Pot with some candy and a Card. Also she put a Name tag on me…..So Cool…. On her table was also a plate with a cookie and M&Ms’. She was so excited, she couldn’t wait to eat….lol….Finally all the moms had arrived, except for one that came later, so the teacher announced that the students had prepared some songs for us. 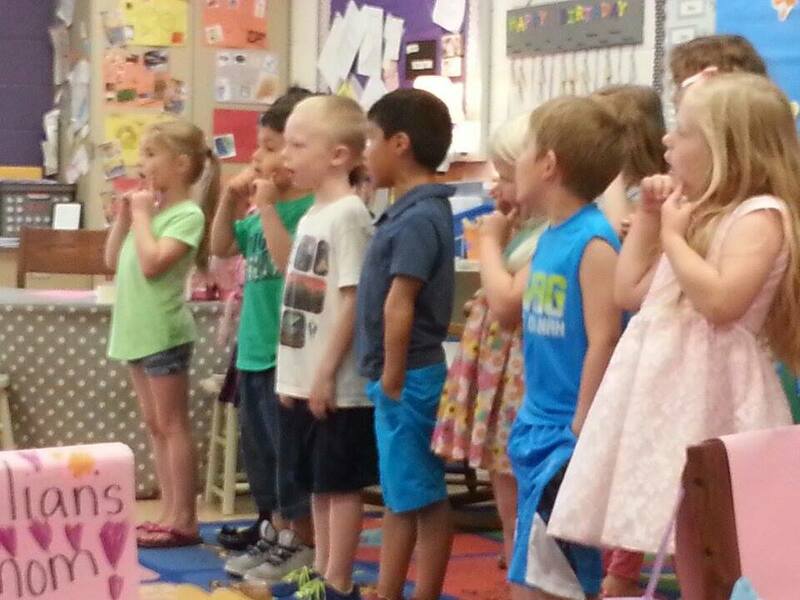 They all filed in front of the room and sang some of the cutest songs. All about Mothers Day. During the songs the kids would present to the parents the gifts from the table that they made….Very Very Cute. Finally it was time to eat. They served punch, made with 7-up and sherbert and cookies and M&Ms’. As I looked around, I noticed how cute the room was decorated. So much fun. I remember when I was in 1st grade, our tables were all in a rows, the blackboard was on 2 walls and above it was the Alphabet picture cards for learning…..a small wall library, and everything was so blahhhh with color. Everything was so symmetrical. Now their is color everywhere. They have different stations. A big rug to sit on for story time, a table for work time, a library area. computer area. Miley said, they even have I Pads to use. There are colored posters and pictures everywhere….The rooms are full of color and activity and art work. The teachers are even so young and cute and pretty. I remember teachers being old, fat, crabby, and lets just say…….NOT PRETTY……!!!!! 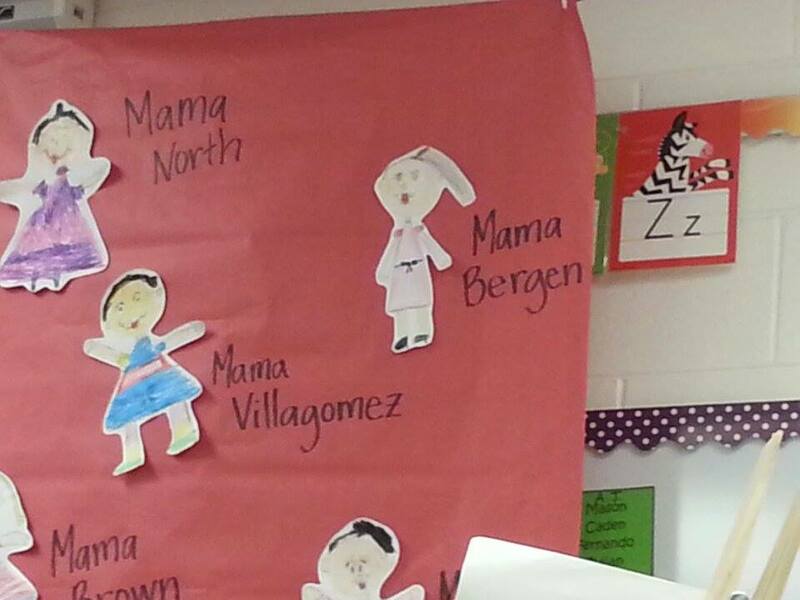 On the wall I found the pictures the kids drew of their moms……. As I was looking around, I looked at the curtains. We never had curtains on our windows. These were solid drapes, were pretty and had tie backs on them…..Such a Homey feeling. I told Miley what pretty curtains she had………and then she said….We close them up during RED DRILL…….????? ?…...It finally hit me. All of this security is for protecting the students and faculty from another school shooting. They have drills on where to go incase of an emergency. The school will go into lock down. The classroom doors are locked ,curtains pulled shut, and kids are instructed where to hid. They have to be hidden from view from the outside. Such a different world we live in today. We use to only have drills to protect us from tornadoes and fire. Now its from each other. Finally the party was over, we ….SIGNED OUT…. and left the building. I looked across to the high school and all the activity outside was over. Tina and Ed were over at the high school. Prom was Saturday nite. A community organization has been putting on a MOCK CRASH for the last 15 years. It’s purpose is for the students to visually see what ….CAN…. happen when you are driving drunk. Tina is a member of Rotary and Ed is on the fire department. They had set up several cars in the parking lot to look like a 2 vehicle crash. They staged 3 kids in the accident, 1 dead and 2 critically injured. 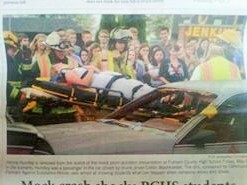 Then the whole student body came out to witness the extrication and the horrible reality. When I had just arrived at the Primary building across the street, the fire trucks were just arriving. Tina and Ed said, it was a very emotional time for the students and also the parents of the injured the kids were cut out with the jaws of life, were hauled away in the ambulance. The coroner was also present and gave a slide show of accidents. It really gave the kids something to think about before the Prom. These were things we never thought about back then. I think the worst our parents ever thought about was if we were drinking, hoped we wouldn’t come home pregnant. From one side of the street, we are protecting our children from the outside forces, and across the street at the high school, they are trying to protect the students from themselves. In 10 years, which will go fast…………..Miley and Austin WILL be across the street at the High School……. This is really just some FOOD for thought….. The differences from generation to generation…..The changes from when I was in school in Toluca…..to when my children were in this same school in Granville….To now that my Grandchildren are in school……Crazy isn’t it….. I am reblogging this post as I sent it before it was done. If you received 2 of this post, this is the correct one….